Building a brand-new cryptocurrency isn’t as difficult as you’d imagine. In 2017, the recipe for crypto success (or at least raising money) went like this: Publish a white paper and a road map that outlines your big idea, develop a token on a platform like Ethereum and then market this token directly to the public via social media. Raising startup capital no longer required painful meetings with venture capitalists and high-net-worth investors. No more wining and dining with Wall Street investment bankers to pitch to their investors. Better yet, no more Securities and Exchange Commission (SEC) regulations. With enough money to buy ads, anyone can build a large social media following. And with easy-to-launch crypto tokens, it became possible to turn this buzz into money via an initial coin offering, or ICO. It didn’t matter if your crypto idea was terrible or your programming team lacked experience in blockchain development. If you had a catchy name and marketable logo, there was ample capital flooding the crypto markets looking for the next big decentralized idea. With a low barrier to entry and nonexistent regulations, entrepreneurs, speculators and (unfortunately) con artists jumped on the opportunity to create blockchain-based tokens, and sell them directly to the public. According to CoinDesk, crypto ICOs raised more than $4 billion in 2017, which was 100 times more than the total raised before the start of the year. In that same time period, CoinMarketCap estimates that the number of cryptocurrencies has more than doubled, rising from 630 to 1,594 today. This feeding frenzy spurned regrettable crypto investments such as Jesus Coin, dubbed the “currency of God’s Son”; Dentacoin, aimed at providing affordable dental care; and Bananacoin, a token used to represent the sale of bananas. Additionally, there were hundreds of other tokens billing themselves as the next bitcoin. Celebrities used their star power to cash in on this phenomenon. Boxing champ Floyd Mayweather briefly changed his nickname from “Money” to “Crypto” and took to Instagram to promote obscure tokens named Centra, Stox and Hubiits. Socialite Paris Hilton tweeted about a little-known token called LydianCoin: “Looking forward to participating in the new @LydianCoinLtd Token!” but later deleted that tweet after Forbes reported on the founder’s ongoing legal troubles. The majority of these new projects were launched using Ethereum’s ERC20 token standard, causing Ethereum’s price to skyrocket. On January 1, 2017, Ethereum traded for $8/coin. On New Year’s Day a year later, it had risen 100 times that price to $800. 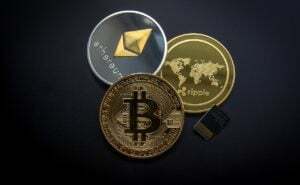 However, recent moves by Google, Facebook and Twitter to ban crypto ads closes the chapter on the get-rich-quick schemes. Entrepreneurs will no longer be able to market their next fruit-tracking or root-canal token via these social media platforms. Additionally, heavy-handed regulation is likely, as the SEC recently ratcheted up pressure on a number of crypto firms. Last month, Robert Cohen, head of the SEC’s cyber unit, claimed at least a dozen companies have put their offerings on hold after the agency raised questions. Regulation is a good thing, and cracking down on these unscrupulous actors was long overdue. Bad apples lead to the narrative that “the crypto markets are a scam,” and this takes away from the myriad of credible projects that are leading the decentralized revolution forward. However, in the short term, this drop in demand for Ethereum led to a 68% price drop since peaking at $1,400 in mid-January. Once considered a rival to bitcoin’s throne because of its programmable capabilities, Ethereum has plunged over 50% versus bitcoin in the past few months. In the longer term, as our world becomes increasingly automated, Ethereum’s protocol will serve as the backbone of the autonomous revolution.